Reclassing is a feature that allows you to directly change a character’s Class to one of 6 Classes, ranging from Pegasus Knights to Curates. After Reclass, a character’s Level and Experience remains the same, but their other stats (like HP, Strength) and weapon proficiency may change. You can Reclass characters as many times as you want (from Chapter 4 and onwards, and in the battle preparations menu only), although there are limits on the amount of one class you have. So don’t expect to have a full army of Myrmidons, for example. 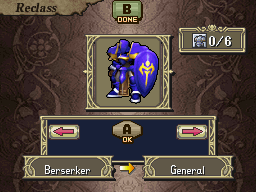 Also, characters whose Class is Lord, Thief, Ballistician, Chameleon or Manakete cannot Reclass. Promoted classes can still Reclass, but they can only change between promoted classes, eg. Dracoknight, Bishop. The stat (eg. HP, Strength) changes from changing between classes is equal to the new class’s base stats minus the original class’s base stats. The character’s growth rates depend on their class, and are equal to the character’s base growth rates + the class growth rates. If a character cannot use a weapon type in their new class, but could in their original class, that weapon type’s level is lost (but gained Weapon Exp remains). 1 + the number of characters with the same class that you could have recruited up to that point (including characters from sidequest chapters or alternate characters, but not including the faceless replacements). For example, by the end of the game you should be able to have a maximum of 7 Knights or Generals (from: 1 + Draug + Roger + Dolph + Macellan + Horace + Lorenz). Characters are divided into three Class sets: Male A, Male B and Female. Characters can only Reclass to the Classes in their set, with their initial class determining what Class set they’re in (eg. Frey is a Cavalier so he’s in the Male A set).